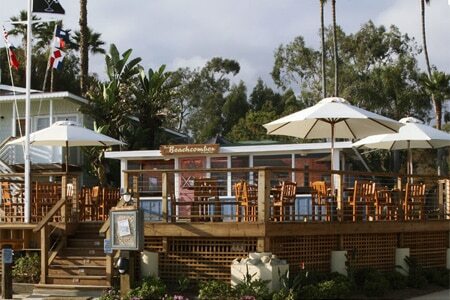 : Located in the Crystal Cove Historic District, The Beachcomber is perhaps Orange County's best on-the-beach restaurant. Nestled among the cliffs and cottages at '40s-era Crystal Cove, it sits as a tribute to the eclectic village of artists and families who once lived here. Set in a Craftsman-style bungalow, the eatery is not just a casual café with a view. Some people frequent the place for coffee and beignets or a hearty crab cake Benedict on foggy early mornings. Executive chef Carlos Olivera oversees a seasonally changing lunch and dinner menu that puts an emphasis on organic ingredients. Start with kung pao calamari with crispy rice noodles and cashews, or the field greens with roasted beets and baby shiitake mushrooms. Entrée standouts include the bacon-wrapped diver scallops with coconut black rice and asparagus frisée salad. If you come at sunset, which is highly recommended, you'll be on time to witness the bugle salute and raising of the restaurant's “martini” flag, a tradition started by the original cottage dwellers. Visitors must park at the Los Trancos parking lot, located on the inland side of Pacific Coast Highway, and can either take The Beachcomber Shuttle ($1) or embark on a winding walk that tunnels under PCH to access the restaurant.